Circulating Library: You Mean You Don't Have An Inflatable Dalek In Your Spare Room? 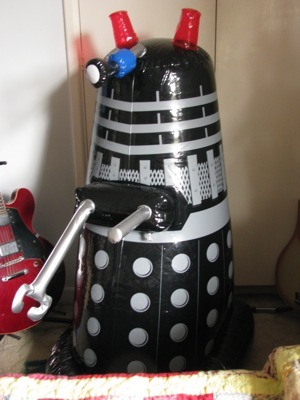 You Mean You Don't Have An Inflatable Dalek In Your Spare Room? What on earth do you keep in there, then? Nick’s sister sent this to him for Christmas, and I’ve only just inflated it, because I needed to get a new pump (the old one finally succumbing under the strain of reinflating my plastic palm tree). 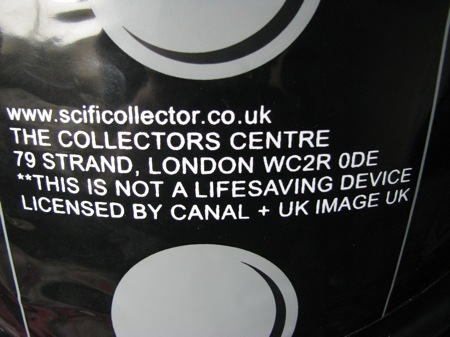 And, honestly, hand inflating a Dalek is nowhere near as easy as it sounds. I have a somewhat conflicted relationship with inflatable objects. My best friend gave me an inflatable palm tree for Christmas the year before I moved the Brisbane, to get me into the tropical spirit, and it stood in the corner of my kitchen for years—until it starting deflating faster than I could reinflate it. I’ll need to locate that puncture at some point. Prior to that, my parents bought me an inflatable version of Edvard Munch’s “The Scream,” which was fabulous—except it brought out the worst in my mother. When I was waitressing and coming home late at night, she’d relocate it from my bedroom to places like the toilet or the bathroom, so I’d open the door and scream. She found this endlessly amusing until the day she set it up just inside my bedroom door, forgot about it, and scared the living daylights out of herself when she went in with some washing. Well, now: that’s something of an understatement.